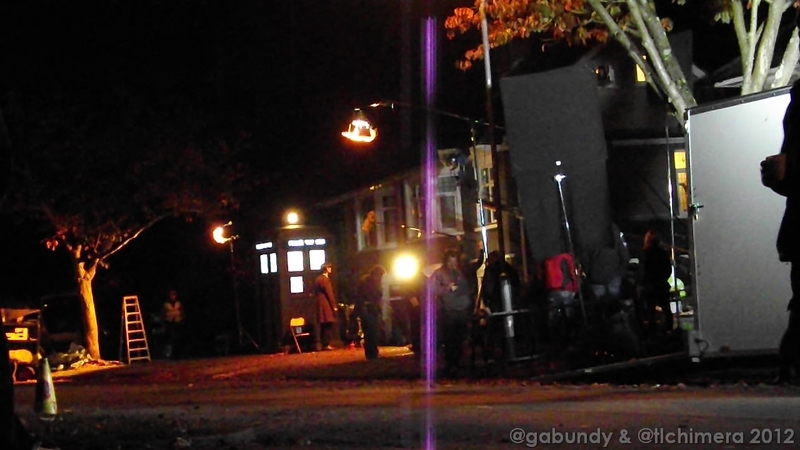 For the third day running I drove the boyfriend and myself to Beatty Avenue to witness Doctor Who filming, yesterday. It was one of those days where it paid off to be patient as filming was slow, dull with little to see in the afternoon, but was truly awesome in the evening! 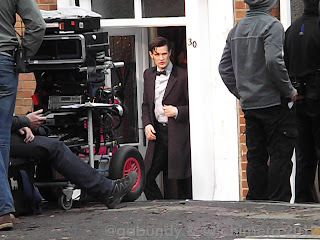 When we arrived they were already filming a small scene of The Doctor shouting "Clara, Clara!" in an alarmed manner at her front door, sonic-ing it, before running into the house. He appeared to sonic up the stairs after this. 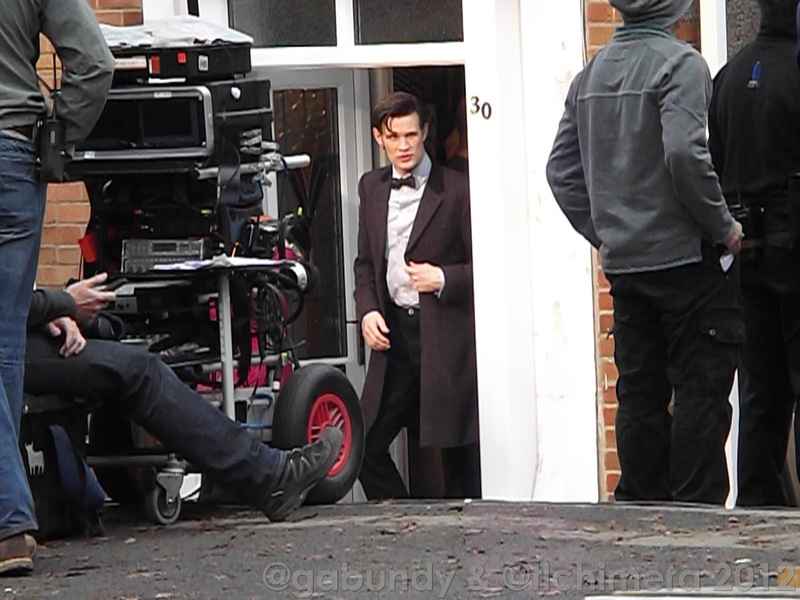 Matt was standing outside the house between takes, but unfortunately the trees in the garden hid most of our view of him. 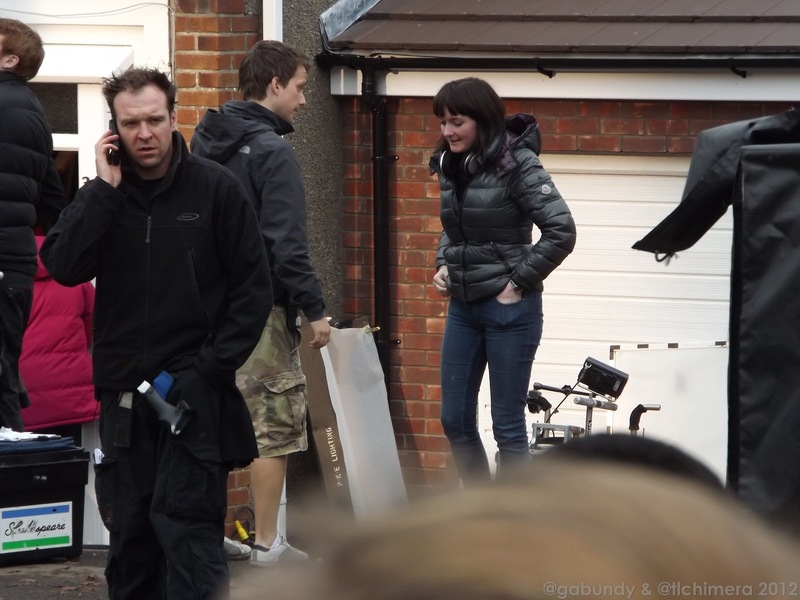 Caroline Skinner (Executive Producer) was on set. 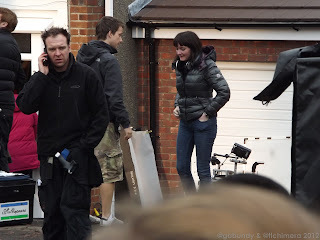 There was a little girl inside the house, who we saw when she came out for continuity pictures (they photograph the actors to make sure they dress them in the same way if/when they film them again) and to leave. She looked between 8 and 13 and wore a white dress which had an old fashioned pink flower pattern over it. It looked pink from a distance. It had a white frilly collar, pink buttons down the front of it and two pockets. Her brown hair was wrapped in a plaited bun. She had orange markers in it (presumably a reference point for effects to be added later?) We also saw her wear a green swimming cap with the same orange markers on it - again there must be some kind of effects going on with her head. We were lucky enough to have a position where we could see what was going on inside the house: The Doctor runs to the door calling to Clara and there's no answer, but he can see something through the door so he sonics it open. Then he rushes in calling her name, she's lying on the floor and he scans her with the sonic. He stands up and looks up the stairs, points his sonic in that direction and makes his way up them. 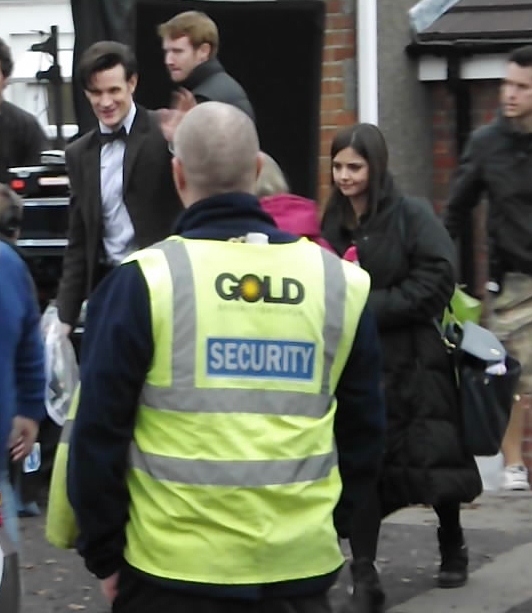 Matt and Jenna leaving for lunch. 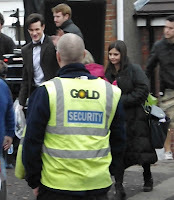 We also saw a scene where Jenna Louise Coleman is standing at the bottom of the stairs and the young girl walks down the stairs towards Clara, with her hand running along the banister, before pausing on one of the lower steps. After this they broke for lunch (/the meal they have in the middle of their filming day.) The scene that happened afterwards was quite fantastic, and seemed to be the one that leads directly to the scene we saw filmed on Monday. 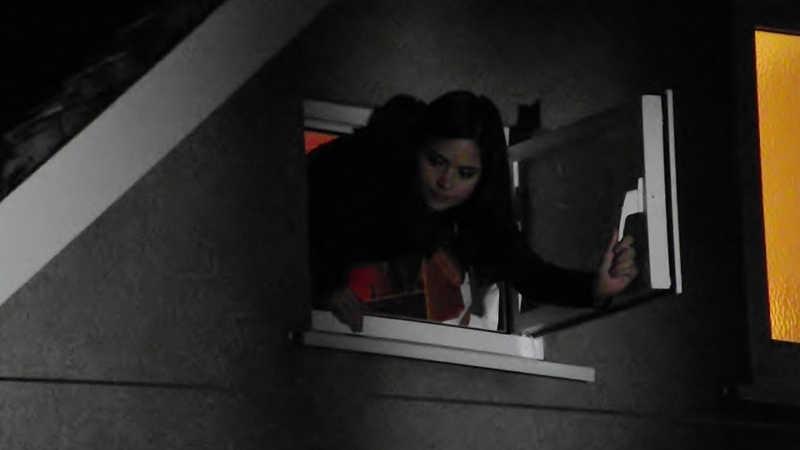 The scene starts with Clara leaning out of the house's attic window and calling to The Doctor. She can't remember having gone to bed and asks what's happened. The Doctor - who is by the Tardis, on the netbook - launches into a dialogue about different phone calls and the 'household tasks' he's been doing. The Doctor calls goodnight to her and Clara then goes back inside the house. She then leaned back out of the window and after some back and forth about whether The Doctor is going to stay down there all night she decides to join him. I've attempted to put the dialogue together below, many thanks to @ryanfarrr's awesome ears and @gabundy's videos. 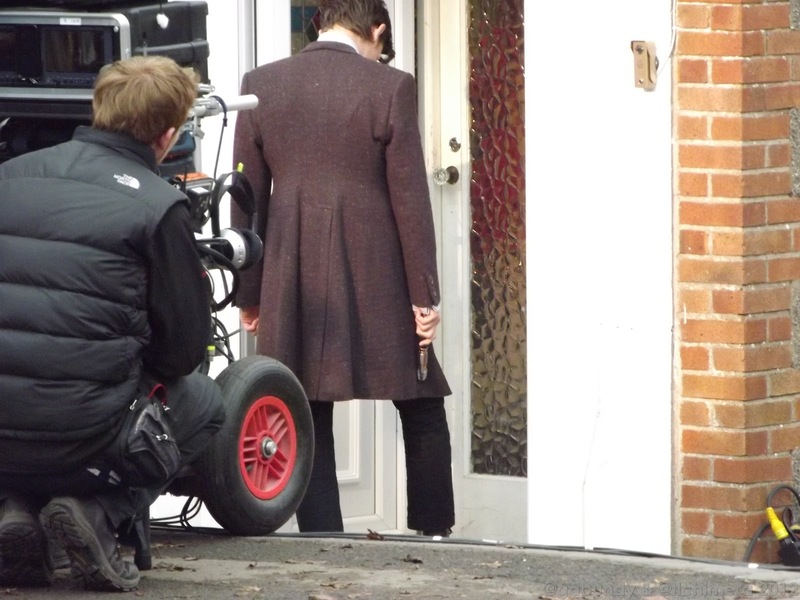 The Doctor is on the driveway of the house where Clara works. 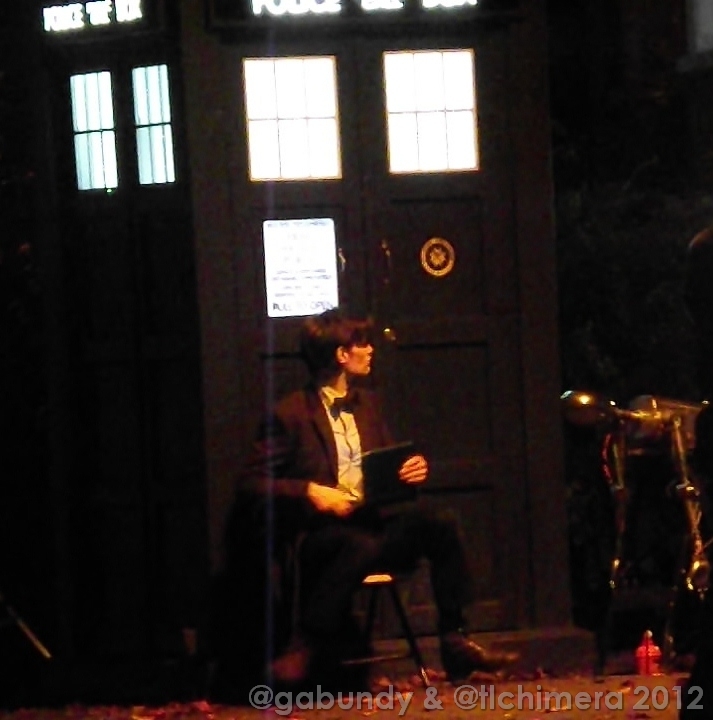 The Tardis is parked up and a robot is lying on a workbench, with the Doctor sat beside it on a netbook. Clara leans out of the attic window at the side of the house. The Doctor looks up. He stands, putting the netbook on the chair. DOCTOR: Hello! Are you feeling better? CLARA: I don't remember going. The Doctor pulls out a piece of paper and moves over towards the house. DOCTOR: Oo, quite a lot actually. Angie called and left a message - she's staying over at Nina's. Apparently that shouldn't be a problem. For god's sake get off her back! Also Dad phoned, complaining about the government, he seemed very cross with them. I've got several pages on that. I said I'd look into it. I fixed that rattling noise in the washing machine, indexed the kitchen cupboards, optimised the photosynthesis in the flowerbeds, I assembled a quadricycle.. DOCTOR: I found a disassembled quadricycle in the garage. DOCTOR: I invented the quadricycle! 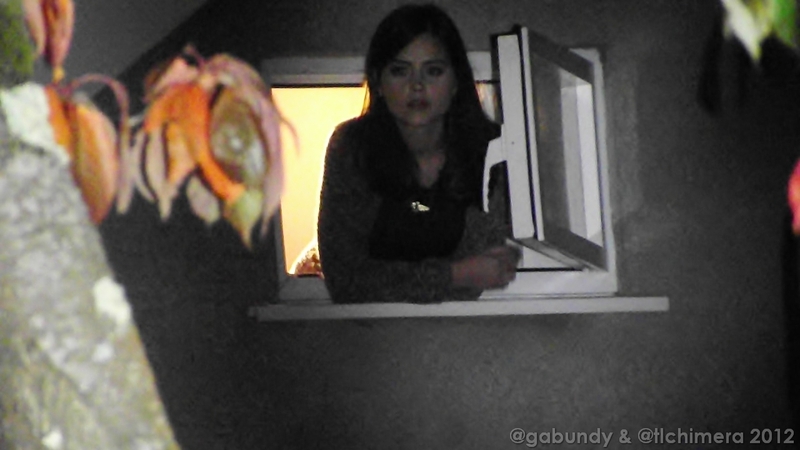 Clara withdraws to her bedroom, closing the window. A few moments later she bursts back out of the window. CLARA: Are you guarding me? DOCTOR: Well yes, yes I am. CLARA: Are you seriously going to sit down there all night? DOCTOR: Yes I promise, I won't budge from this spot. CLARA: Well then, I'll have to come to you! The Doctor flusters, stands up and brushes his hair back. He moves over to the robot and starts fiddling with the leg of the robot - using a spanner on the knee and pulling/extending the leg. It was great to again be in a position where a lot of dialogue could be heard! Both Jenna and Matt came over and did autographs again, and I was lucky enough to get both of their autographs. I'm going to pop that and the signed photo in a separate post as this one is already overlong! Simon also tweeted a nice video of the whole scene. Jenna was wearing a leopard print dressing gown. #dwsr Snow strikes Bristol in August! I believe in the possible. Luckily, that is nearly everything. Thanks to wallz.eu for the wallpaper and http://www.gerrendesign.com/ for the chimera illustration. Simple theme. Powered by Blogger.